Barcode .net library component supports most used linear and 2D barcodes. It has asp.net components. The symbologies includes Codabar, Code11, Code128, Code39, Code39Ext, Code93, Code93Ext, Ean13, Ean8, Industrial2of5, Interleaved2of5, UccEan128, MSI, Postnet, Planet, Telepen, UpcA, UpcE, IntelligentMail, Sscc18, Scc14, Itf14, PDF417, MacroPDF417, DataMatrix, QRCode. It is very easy for ezBarcodeComponent to databind in application and used in Crystal Report, even in web services. 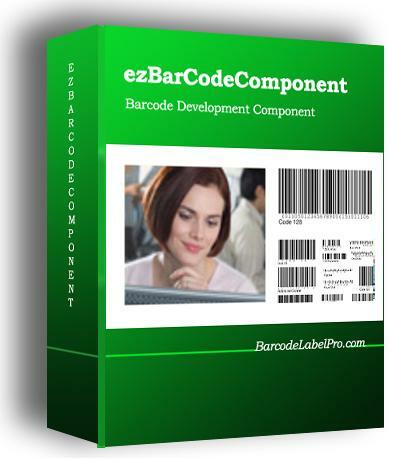 We includes examples in developing project for windows forms, crystal report, web services, data binding and asp.net.ezBarcodeComponent lets you rotate, save the barcode images. Five examples are also included in the download. 1) DataBinding Example ezBarcodeComponent allows to drag the data field from data source and drop it to the ezBarcodeComponent control. The data field is automatically binded to the control. The DataBindingExample project will show how to use data binding with ezBarcodeComponent. An Access Database is included in the project and the data field is binded to the barcode control. 2) Crystal Report Example CrystalReportExample project displays how to use ezBarcodeComponent to create a crystal report. An Access Database is included in the project. A generated byte array column "Barcode" is added to the table to hold the barcode image. 3) Windows Form Example WindowsFormExample project demonstrates the use of ezBarcodeComponent.WinForm component. 4) ASP.NET Example ASPNETExample project demonstrates the use of ezBarcodeComponent.Web component. 5) Web Service Example WebServiceExample projects demonstrate how to use ezBarcodeComponent to create and use a web service. There are two projects in this example. The WebService project is the project creating the web servce. WinFormTestForWebService project is a window form project uses the web services. This site does not contain serial number, crack, keygen Barcode Component for asp.net serial number : serial number is the simplest type of crack. A serial number(cdkey,product key,etc) is register the program as you may already know. a crack or keygen may contain harmful software. If you cannot find the exact version you want, just give it a try. for more information read .nfo/.txt/.diz file include in zipped file.